Simon Says Pull My Finger: A Flash Memory game. Similar to the 1990's electronic toy "Simon", this game requires the player to listen to a sequence of fart sounds, and then repeat the same sequence by pulling the fingers of the same colours in the same order. Sounds easy? It's tricky to remember once the sequence gets complicated, more so when you're trying not to laugh at the fart sounds. It's easy to exchange the fart sounds for simple electronic tones, and remove the fingers, converting the game into an easily rebranded memory test game for numerous marketing projects. Simon/Pull My Finger source code. 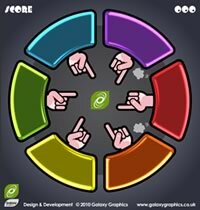 The source code for Pull My Finger is also available to buy from Galaxy Graphics. The fla file for this game is written in Flash CS4 and Actionscript 3.0 Click here to contact us about Pull My Finger source code.